I work in an interdisciplinary lab that combines materials science, engineering, and biology to solve novel problems. 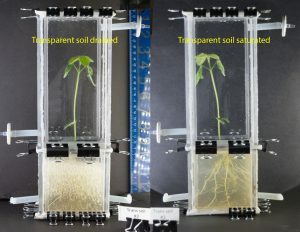 We have developed a hydrogel based transparent soil that we use for root phenotyping. We are now further developing this system to more closely mimic soil. We can now change the size and density of the gel beads, to mimic different kinds of soil. These beads can be mixed or layered to observe the root response. We can also change the water availability, to observe the effects of different water-related phenotypes. My project focuses on developing methods to create a microbiome system in our transparent soil. Microbiomes are extremely important and play many roles in plant growth, the carbon cycles, and filtering VOCs from the air. However, they have a tendency to become pathogenic in low gravity. I will encapsulate microbiomes in gel beads in a manner that allows for the exchange of metabolites while physically limiting the microbes to the bead. This will prevent pathogenic overgrowth, while still allowing for beneficial interaction.